“My son has had a wonderful time at Kindermusik – he has enjoyed the music, dancing, playing with other babies and the lovely teacher – Verna. Verna makes the class so enjoyable for the babies, she is so calm, gentle and kind. Lachie gets excited as soon as we walk into class and he sees her. We have re-enrolled for next term.” – Kindermusik Village parent (April, 2009). 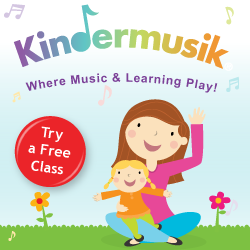 Join us for a FREE Kindermusik Preview lesson* – there is no better way to find out what Kindermusik is all about! NB * Free trial is for new families only. Free trial classes may also be offered to those families wanting to experience the next curriculum in the Kindermusik Continuum (ie. in the case of a family getting ready to move from Sing & Play to Wiggle & Grow or from Wiggle & Grow to Laugh & Learn). One preview class per child. May not be combined with any other offer. Previous Post Cuddle & Bounce: a new Kindermusik curriculum for babies!